The goal of Click and Grow is to make the most essential, fresh, vitamin-packed food free for everyone on this planet. They believe that everyone deserves to enjoy clean fresh food and thrive and they are moving toward this goal by offering high-quality indoor gardens and food growing systems that support their dream of building large, self-sustainable farms to locations where they are needed the most. Click and Grow uses both science and technology to naturally optimize plant growth. According to Click and Grow, “Smart Soil” inspired by NASA technology creates the perfect environment plants need to thrive. It is a patented material comprising of natural coco-coir and peat that keeps the level of oxygen, water, pH and nutritional ingredients at optimal levels, helping to reduce water consumption by 37 times and cut the cost of technology by 68%. As the plant grows and goes through its various cycles, Smart Soil releases nutrients keeping the soil soil pH balanced, and employs tiny oxygen pockets to guarantee plants get ample breathing room and nutrients even when the soil is wet. 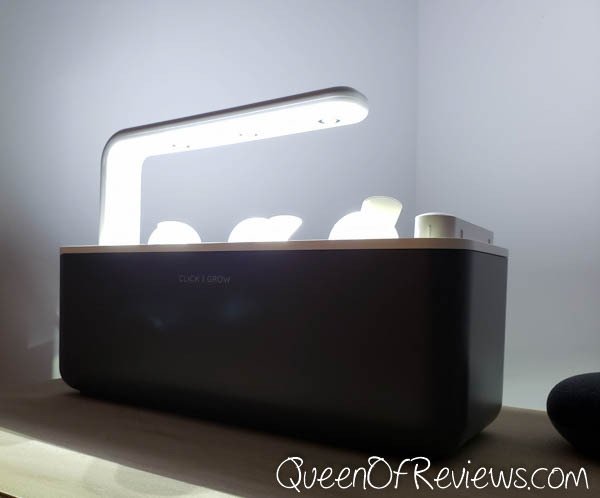 The Smart Garden’s adjustable LED lamp furnishes plants with enhanced light spectra that spurs growth. The built-in timer turns on the light for 16 hours each day. It’s the perfect amount of light for faster growth and the state-of-the-art LED lighting is optimized for plant growth. Assembly of the Click and Grow Smart Garden is easy and straight forward and everything is labeled really well. I love that all of their seeds are Non-GMO and also having the plants indoors cuts down on the amount of bugs eating on the plants. The picture above is our Basil plants after 2 weeks, looking nice and green and growing pretty well. 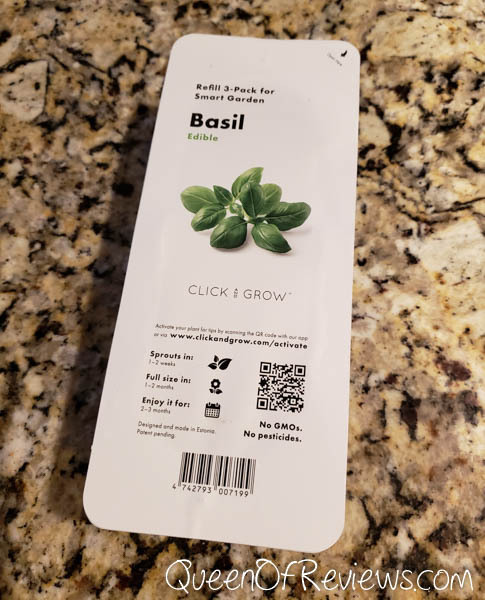 I do wish the kit came with more of a variety than just the 3 Basil plants, we do use Basil, but some Parsley, Thyme or Mint would have been great. 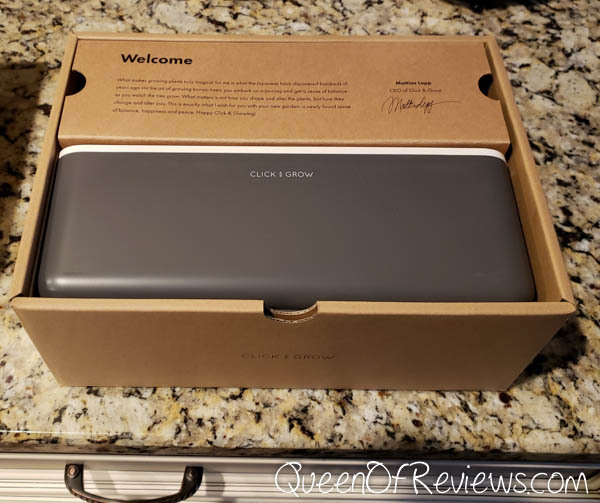 So what are the drawbacks to the Click and Grow Smart Garden 3? I do not think the Smart Garden 3 is as smart as it should be. The app which is currently unavailable for Android due to it being updated, just provides tips and documentation, no functionality. The timer for the lighting starts as soon as you plug it in, so if you want its 16 hour cycle to end by 10pm you are going to need to get up at 6am to plug it into to start that cycle. Why can’t the app allow me to set the schedule? I like the water tank and the fact that it holds enough water for a month, but shouldn’t a “smart” garden have a water level sensor that sends me a notification when water is needed? The other drawback is cost, the replacement pods are $9.95 plus shipping unless you purchase $40 or more, that is pretty pricey compared to a starter plant from the local home improvement store. I do think the price is going to be a barrier for many, the Smart Garden 3 is their cheapest model at $99.95. With only 3 slots and the slots are pretty close together which means a big leafy green like lettuce could crowd out its neighbors. 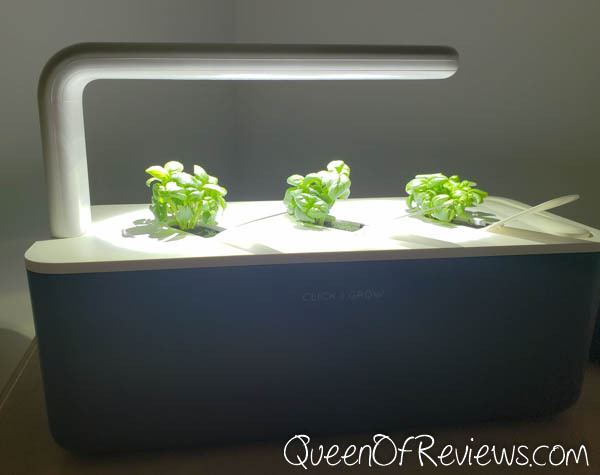 I think the Smart Garden is great maybe for the kids to get involved, to grow a few herbs, but I do not see it being able to provide enough return especially for a family of 6 like we have. Head over to ClickandGrow.com today and check out their various gardens, some which can hold up to 51 plants and be sure to show them some love on facebook, twitter, Instagram and Pinterest. Honest review…I appreciate that. I used to have an aero garden but it took up a lot of space…and that bright light. One of my neighbors thought I had a ‘ grow house’. I. Actually like this size but woukd also like more varuety of herbs. Yeah the size is great. I plan to remove a couple of the basil plants because we just do not need this much and replace them with something else. The plants do grow really well and quite effortlessly as long as you keep the water tank filled.